Cycling has been a neglected area of Labour policy. Sure, our transport spokesmen and women have, over the years, supported the idea of getting more people on bikes with promises of a bit of extra money and lots of positive references in statements and reports. A few good facilities have been built, especially in London and in the few towns that already have a traditionally high number of cyclists, such as Cambridge, York and Oxford. In Scotland, great progress has been made in Edinburgh, where the local authority has committed to spend 10 per cent of its transport budget on cycling. More often than not, though, the few cycle lanes that have been built are unsafe as they are not segregated from the rest of traffic, or do not provide a through route, ending abruptly where engineers have thought it was too difficult to continue them. It is therefore no surprise that, overall, cycling’s modal share remains stuck at around 2 per cent, despite the expressions of support from both local and national politicians. There is huge pent-up demand from people who would like to cycle, and to get their kids on bikes, but feel unable to do so because they view cycling in this country to be too dangerous. This must change. That’s why a small group of Labour Party members have decided to form Labour Cycles, in order to push for Labour to adopt pro-cycling policies both locally and nationally. Let’s confront head-on the often-expressed doubts among some party members about cycling: that it is an irrelevance, an activity for a privileged few white middle-class males who are daft enough to brave the traffic or, worse, who threaten the safety of pedestrians by riding on pavements and going through red lights. This represents a failure to understand how cycling can be an agent of change for a wide variety of social improvements. Take health. An extensive study found that people who cycle to work have been found to have a 40 per cent reduced chance of developing heart disease and a similar reduction in cancer. Cycling offers the opportunity to exercise moderately every day without having to find the time to squeeze it into busy lives or spend exorbitant amounts in gym membership. Adults who cycle to work have lower absentee rates, while children’s energy and attentiveness at school are improved. shop locally and spend more than those who drive. Indeed, Steve Robson, who owns the Acorn Hardware store in Newcastle, had initially campaigned against improved cycling measures but since the changes has been impressed by the extra business that has come his way and admits he was wrong. This example can be repeated many times across the country, but hearts and minds have to be won over and that is why it is so important for Labour to have the right policies. And, of course, there is the fact, often ignored, that cycling is a cheap form of transport, saving people hundreds of pounds annually in fares or fuel. Far from being a middle-class activity, cycling can be a catalyst for helping the less well-off who cannot afford cars, to be more mobile. It might be in part true that cycling is currently the preserve of healthy and wealthy middle-class professional but that is simply another illustration of the inequality in our society. We need the health and social benefits of active transport to be extended to those who really need it. an unconsidered after-thought on transport policy and, instead, make it a central part of Labour’s strategy. Please sign up to the inaugural Labour Cycles event on Saturday February 3 in central Manchester. Only £10, £5 for concessions, inc lunch. Speakers include Rachael Maskell, Chris Boardman and many more. 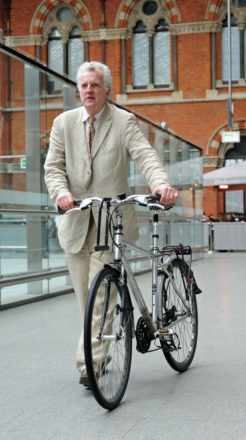 Christian Wolmar is a transport author and was a Labour parliamentary candidate in 2016.